Experience all of the natural beauty that Niagara Falls has to offer this summer by exploring some incredible areas like Oakes Garden Theatre, Queen Victoria Park, the Niagara Gorge, and Niagara Botanical Gardens. A day in the park is a wonderful way to connect with nature and pass some time in Niagara Falls, and there are many beautiful parks located all around the city that offer great spots for walking, picnicking, and relaxing. Oakes Garden Theatre, situated right across the street from the Sheraton on the Falls, features beautiful flower displays, ponds, and lush greenery along with breathtaking views of both the American and Horseshoe Falls. Oakes Garden Theatre is also the entrance to the expansive Queen Victoria Park and hosts a number of exciting concerts and events throughout the summer. You can also connect with nature by exploring one of the Niagara Glen hiking and walking trails, which allow you to explore and discover the incredible Niagara Gorge. 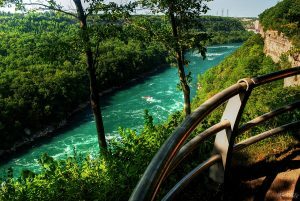 The mighty Niagara River flows through the gorge, which features a powerful whirlpool and class 5 rapids. The trails will take you through pristine Carolinian Forest, past amazing rock formations, and to spots that directly overlook the river and whirlpool. And to see impressive floral and greenery displays created with lovely summer flowers and plants, make sure to stop by the city’s Botanical Gardens. Offering 99 acres of diverse garden displays, the Botanical Gardens are a beautiful spot to take a summer afternoon stroll. Walk, hike and enjoy the natural side of Niagara!